Your battery might be making your older iPhone slow. This is because, apparently, iOS system software sometimes slows down older iPhones when the internal battery has degraded to the point where it can no longer sufficiently power the device at the expected performance level. According to Apple, the throttling of device speed is intended to prevent the iPhone from crashing or shutting down unexpectedly due to a worn batteries diminished capabilities. Unfortunately, that device speed throttling could have an annoying side effect of making the older iPhone noticeably slower to the end user. This is often noted after new iOS system software releases, though it should be pointed out that sometimes any observed performance degradation irons itself out over time, or can be successfully resolved with various iOS troubleshooting steps and settings adjustments on the impacted device. But, sometimes an older iPhone or iPad just feels persistently slow, and that could very well be due to having an old degraded battery. The device benchmarking company Geekbench also seemed to confirm an occasionally observable underperformance of older iPhone models based on referencing their own benchmarking data. That statement and admission from Apple is interesting, because there has long been speculation and conspiracy theory that Apple intentionally slows down older iPhone (and iPad) devices with iOS system software updates, but until now most users didn’t know why, they just anecdotally observed it on their devices. That notable performance degradation led to countless theories about why it might happen, along with other theories denying it happens at all and insisting it was imaginary. Well, it turns out that some observed performance decline may directly relate to the older devices battery age and quality. How this all shakes out remains to be seen, as there are already lawsuits against Apple about the battery issue, and the topic has also reinvigorated Right-to-Repair advocates who argue that it’s consumer friendly to be able to easily and reasonably repair your own stuff. This may all sound bad, but there’s actually good news here. 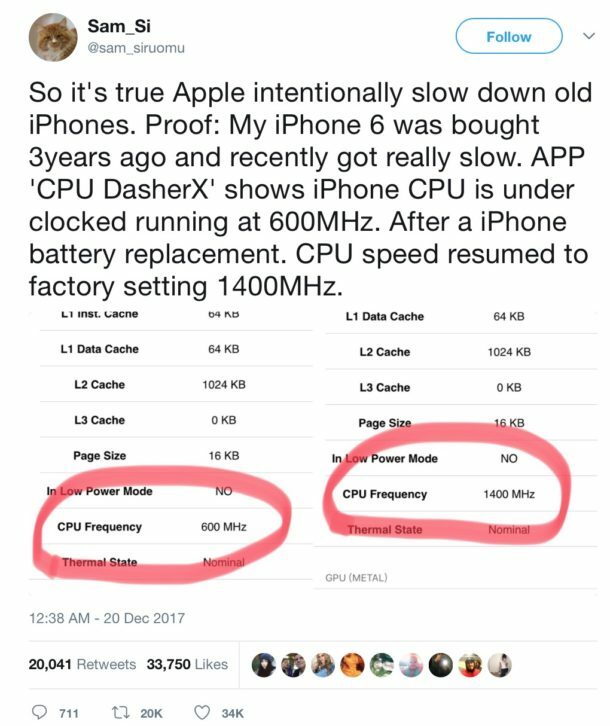 If indeed an iPhone (or iPad) device slowdown is entirely due to an old battery, then replacing the battery should theoretically boost performance back to expectations, much as it did for the Twitter user we cited above, and that has been anecdotally reported as successful elsewhere around the web too. Of course a notable difficulty here is that iPhone does not typically report that its internal battery is old enough to have degraded device performance, nor does the iPhone have an easily replaceable battery. The former situation is something that could be theoretically addressed in a future iOS software update, with a notification along the lines of “battery has degraded and can no longer support optimal device performance” or something similar, perhaps with a link to battery replacement options. The latter difficulty of not having an easily replaceable battery means you’d either need to get an old worn battery replaced by a competent repair center, or take it upon yourself as a DIY project. 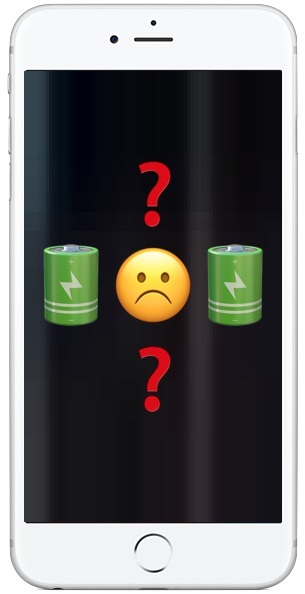 If you do have an older iPhone (say an iPhone 6 or iPhone 6s) that feels unreasonably slow, and you want to see if a battery replacement will restore performance, you’ll need to either contact Apple or an Apple authorized repair center and pay $80 for a battery replacement, or you can get a Do-It-Yourself iPhone battery replacement kit on Amazon for around $40 or so. There’s no guarantee that replacing a battery is going to speed things up and make an older device as snappy as it used to be, but it just might boost performance for some devices under the right set of circumstances. We may not all need/want/be excited about the new 11 iOS features…. Thanks for sharing this. I have been experiencing low performance from my phone and I could not explain it. I will fix it now! Apple should design their phones to die exactly one year after they are activated. While this may anger a few customers, it would greatly improve the bottom line for large share-holders like myself. Let the minions of the world use Samsung or LG phones. I don’t associate with people whom do not use an iPhone or or are not of my class and caliber anyway. Old battery is to blame? Seriously? Apple is to blame. I don’t think he was being serious. What he said was way over the top. Life long apple user no more !!! Most of us don’t have 1100$ to fork over for a phone and we all know including OS X daily that they are doing it to force you to buy a new device !! We all knew with the bosses death it was only a matter of time before the company degraded along with it’s batteries. Probably, the software to throttle older iPhones/iPads as their batteries degrade, is included in updates after a year or so. The problem with Apple software is the constant nagging to update the software on all of their products often on a daily basis, (the nag not the updates) and although I appreciate Apples argument about protecting hardware from under voltage by throttling, I still believe that the real reason for the constant nag to upgrade, may be to include the throttling software in updates after a year or so to render hardware obsolete sooner, not just for security reasons… particularly to phones, which many folks now do replace annually. Companies like 02 now even have “Refresh” contracts that do allow you to upgrade annually, if you are willing to pay the high contract fees. The youth of today (up to 40yrs old) are immersed in the “newest is best” culture and totally accept this “throw away society” encouraged of course by the manufacturers, which in it’s turn is detrimental to the health of our planet. I think Apple have been more transparent to start with, but I can understand why they make iPhones slow down when the battery degrades. If keeping an older iPhone suits you, then get a new battery for it, and move on. My mother is not a wealthy person – apple devices are a huge expense for her. And yet accross many devices – ipads, macs, phones – updates have rendered her older devices useless. I can’t forgive apple for this. The same thing happened after I got so annoyed by the update reminders on my iphone 5 that i updated – after which the phone was annoyingly slower and had less battery. For phone, I’ve already moved to a different brand. it will be the same with the computers soon. All they have to do is allow me to NOT update – or to revert to older factory installed operating system – and stop nagging me. Also make it easier to replace batteries so older devices remain viable (what a strain on the environment to waste so many working devices!). It would also be good if they allowed me to delete some of the stuff on there that i don’t use and which just takes up space. Overall, the user experience of apple has degraded recently, even if the profits are up and the tech is advancing. They just announced a discounted battery replacement too. It seems like the dramatic response really got to them if Apple is actually offering such a steep percentage off. Do you think this will really solve the problem, or will people continue to complain? We are all presuming this is an iOS issue, but I would not be surprised if Apple do this with OS-X as well, let the new updates slow down those older iMac.s and they’ll (we) will think an old computer need replacing.